If you were one of the multitude of Powers fans thrown off by the now-infamous (or famous, depending on who you ask) "monkey love" storyline a few years ago, I'll get this out of the way right now: you're going to want to skip this one. In Michael Avon Oeming's first outing as co-writer alongside Brian Michael Bendis, Detective Walker reminisces once again about his long, twisted past in the earliest days of human history, and the results are very similar to that polarizing original storyline. Although this Powers Annual contains thirty-five pages of story, it's actually a much faster read than most of its regular-sized contemporaries. There's very little dialog, and when there is a speaking part, it's quick and monosyllabic. 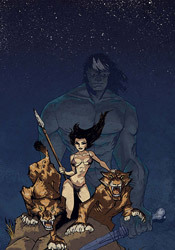 Although Oeming is credited as the co-writer, the bulk of the issue's storytelling falls upon his shoulders as an artist. The story's pacing, its details and its explanations are almost universally unveiled by the artistic direction, and narration is sparse at best. This is basically a playground for Oeming. He tries all sorts of things to help establish that visual narrative and tell the story in a way that it's never been told before. When it works, it can be tremendously powerful... the tense, thrilling moments that follow a collision between two gigantic apes at the outset of the story is some of his best work as a storyteller. But such experimentation comes at a high cost – specifically, the exposure of his faults alongside his strengths. His paneling work, in particular, wilts under the spotlight. When accompanied by Bendis's frequent word balloons and incidental dialog, the flaws in his work's legibility could largely slip by unnoticed. Now, left to tell the tale on their own, they're frequently confusing and tough to follow. Oeming refuses to obey a strict gridwork for his paneling, and although that gives his work a unique flair, it hampers the story's flow and creates a legibility nightmare. I've had problems following Oeming's panels in previous issues of Powers, but always had the roadmap of a sequential dialog to fall back on. When that lifeline is reduced to a series of Cro-Magnon grunts and moans, the façade collapses and everything seems to lump together into a big, confusing mess. Oeming's artwork has seen better days. His work has lost the sharp cleanliness that set it apart during the book's prime, and now often seems extremely hurried and underthought. When it clicks, as it does during the few important moments staggered throughout this issue, his work can still be very effective at delivering a tremendous visual impact, really pulling the reader right into the heart of the moment. When it's off, it drags the quality of the issue down the tubes with it. On a few occasions throughout this issue, I had to wonder if Oeming had actually done his illustration work while asleep. When he's good, he's great but when he's bad, he's terrible... and we get a little of both in this issue. Looking back over what I've just written, I may have been overly harsh on this issue. I didn't dislike the experience so much as I was puzzled by it... a similar reaction to the one I had the last time Powers ventured into this era. Oeming's contributions to this issue's writing have given the book a different flavor than I'm used to, especially in the few pages set in the present, and I'm not sure the change is welcome. The creative team was trying something different with this issue, and I can't fault them for that, but not every experiment can be a success. This Powers Annual was as confusing to read as it was to try and fit into the big picture. If you're a longtime fan, you'll want to give it a shot, but for more casual readers I'd recommend a flip through first.